This pyx has gold plated Loaves and Fish against a red enameled background on the hinged lid. It is a perfect gift for Priests, Deacons, Lay Ministers and Chaplains who bring Holy Communion to large institutions such as Nursing Homes, Hospitals and Correctional Facilities. The pyx is a popular gift idea for a Memorial Remembrance. Measures 3 3/8" x 1" with a generous 44 host capacity. Engraving available, maximum 20 letters for $20.00 additional letters, please add $ 1.00 each. 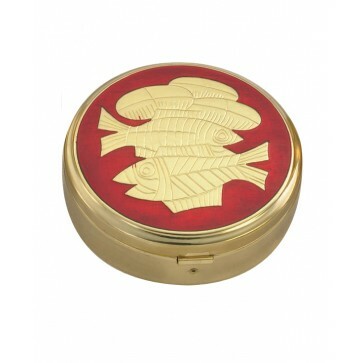 You're reviewing: Pyx with Loaves and Fish on Red Enameled Lid.